Pittsburgh Restaurant Week is a fabulous thing. It gives me a great opportunity to usually have a meal or two at restaurants I might not normally visit because they’re menu is too expensive or just not one I usually pass by. This restaurant week, my schedule was pretty tight, so I ended up deciding to visit two restaurants back to back for a double dinner extravaganza of eating too much in one evening. The first restaurant of choice was the relatively recently opened Eddie V’s. This place is fancy. Located in the old Larrimor’s space, which was a different kind of fancy, it definitely doesn’t look like a clothing store anymore. The new decor is very post modern with a lot of browns and blues and dimmed lighting. Service staff was mostly very attentive from the get go. The one thing that really set the ambiance was the music. Eddie V’s had a live jazz band playing throughout the evening. This was such a classy touch. Only a couple other restaurants downtown have live music, but this was the first one I have been to where I felt the style and volume were appropriate for the setting. My only complaint would be from the minute we sat down our server was suggesting the most expensive items on the menu because the restaurant week menu really didn’t showcase what Eddie V’s is known for serving. And I agree, the restaurant week menu was filled with basic items, but as an introduction to the pricey restaurant it was a good menu. 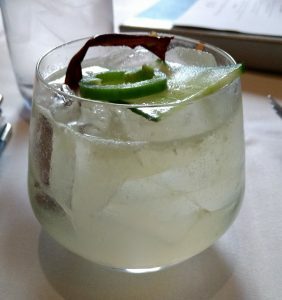 I started my meal with a cocktail called the Maverick. It’s vodka with lime juice, cucumber and jalapeño. It was presented very nicely. It was aromatic and the taste of vodka was completely masked by the ingredients. My first course was a nice sized bowl of lobster bisque garnished with a lobster claw and a small slice of bread and topped off with freshly cracked pepper. Any time something is a larger serving than I expected I am a happy diner. 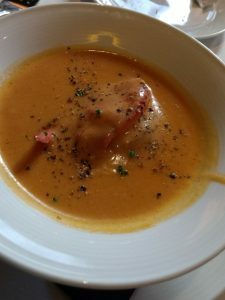 Lobster bisque is probably also one of my favorite appetizer dishes no matter where I eat. It wasn’t too heavy on the cream. The claw was soft enough I could cut through it with the side of the spoon. The cracked pepper added enough extra spice. I’m totally biased though since it’s rare I don’t like a bowl of lobster bisque. Next were our main courses. 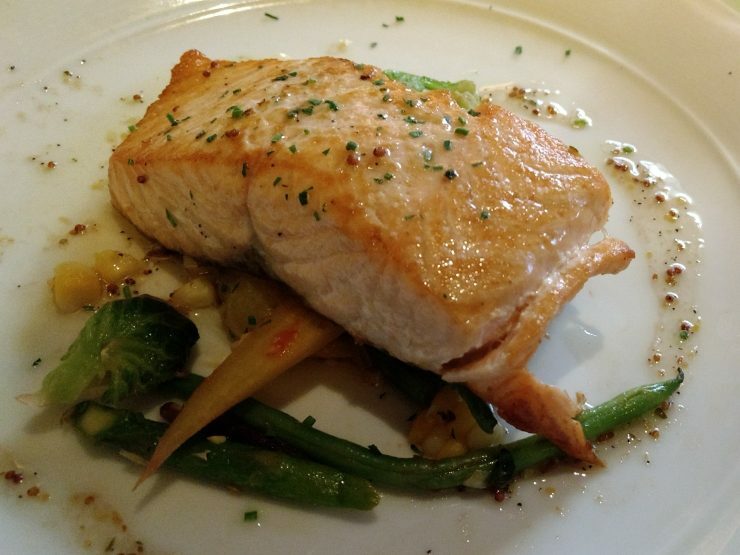 I ordered the salmon. It was a very basic pan fried piece of salmon served on a very small bed of sauteed vegetables. It was prepared and presented well, as can be seen. It was a pretty decent serving size, at least for the piece of fish. So one of the things that was not clear about restaurant week, the side dishes were not included. Eddie V’s intends for side dishes to be ordered separately and shared. We got 4 for the table. I tasted the au gratin potatoes, the brussels sprouts with bacon and shallots, and sauteed monterey style sweet corn. Each of the sides were a great accompaniment to the meal. My favorite was easily the brussels sprouts. 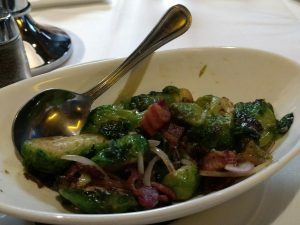 When brussels sprouts are prepared right with the correct, especially with bacon they are going to taste great. The potatoes were so cheesy and still bubbling when delivered too the table. To be clear, I would have easily finished this main course if I was only having one dinner. However, since I was having two dinners, I used some rare self restraint around food and took half home. 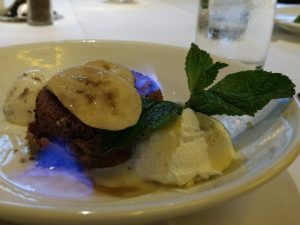 The dessert capping off dinner one was a bananas foster served with ice cream and flaming rum. The presentation of this dish was stellar. The servers showed up with gravy boats filled with rum, set them on fire and poured them over the dish. I wish I was faster in taking my photo to see this dessert up in flames. The crust was caramelized just right. And it tasted delicious…deliciously covered in rum.